Under the Work Health and Safety Regulation 2011 (WHS Regulation), SafeWork NSW recognises all interstate General Construction Induction Training (GIT) cards issued under corresponding Work Health and Safety legislation as well as a range of cards issued under previous arrangements. Any GIT cards issued under current or former arrangements will only be recognised in NSW if they continue to be recognised in the issuing jurisdiction and have not been cancelled, suspended or expired. In addition, cards from any jurisdiction will only be regarded as valid provided the holder has not been out of the industry for more than two years as per clause 316 of the WHS Regulation. 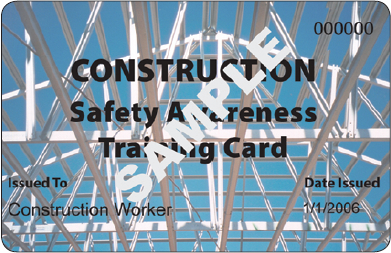 Construction workers with valid versions of these cards are not required to undertake GIT in NSW and are not required to obtain a SafeWork NSW GIT card. SafeWork inspectors will regard these interstate cards as evidence of meeting the requirements for GIT under clause 317 of the WHS Regulation. These interstate cards must be produced if requested by a NSW inspector. An inspector may also request a sample of the person's usual signature. If a person carrying out work in the NSW construction industry claims to be in possession of one of the interstate cards and cannot immediately produce it, an inspector may consider issuing an improvement or penalty notice to the person in control of the site or the construction work. NSW GIT cards issued under the WHS Regulation from 1 January 2012 and NSW construction induction cards (issued from 1 September 2009 to 31 December 2011) are recognised throughout Australia. The former NSW construction induction cards (issued between 29 March 2004 and 31 August 2009) are recognised in all jurisdictions other than Western Australia. Australian Capital Territory cards are issued by ACT WorkCover as proof that an individual has been provided with training which meets the requirements of the Work Health and Safety Regulation 2011 (WHS Regulation ACT) and previously under the National code of practice for induction for construction work (National Code). Cards issued by ACT WorkCover from 1 September 2009 to the current time are recognised in NSW. Northern Territory Construction induction cards are issued by NT WorkSafe as proof that an individual has been provided with training which meets the requirements of the National Code. Northern Territory construction induction cards are uniquely numbered. The card must also carry the Northern Territory Government and NT WorkSafe logos. Tasmanian construction induction cards are issued by Workplace Standards Tasmania as proof that an individual has been provided with training which meets the requirements of the National Code. Tasmanian construction induction cards are uniquely numbered and must carry the Workplace Standards Tasmania logo. Both Western Australian blue cards and construction induction cards, issued by WorkSafe Western Australia, are recognised in NSW. 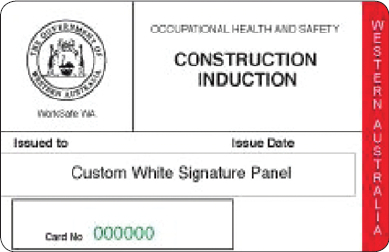 Western Australian construction induction cards, which have been issued in Western Australian since September 2009, are uniquely numbered and are issued as proof that an individual has been provided with training which meets the requirements of the National Code. The card must carry the WorkSafe Western Australia logo. Western Australian blue cards are also uniquely numbered and include date of issue, name and signature of the card holder. Western Australian construction induction card were replaced in September 2009, however, they are still recognised in NSW as proof of general construction induction training. SafeWork SA issue White Cards upon submission of records showing that an individual has been provided with training which meets the requirements of the National Code. White cards are uniquely numbered and this number incorporates the identification number of the RTO that was responsible for conducting the training. The white cards include the date of issue, birth date of the cardholder, name and signature of the cardholder, and carry the SafeWork SA logo. Workplace Health and Safety Queensland issue white cards as proof of general construction induction training under the Work Health and Safety Regulation 2011 (WHS Regulation QLD) and previously under the National Code. White cards are uniquely numbered, show the cardholder's name, signature and include the number of the RTO responsible for the training. Workplace Health and Safety Queensland issued blue cards following the completion of the 30215QLD - course in general safety induction construction industry. From 30 June 2009 the blue card ceased to be issued, however, it will be regarded as proof of general construction induction training in NSW. Blue cards must also include the date of issue, name and signature of the cardholder, name of an RTO and national provider code, signature of the person who conducted the course, or their representative. Note: In NSW, only blue cards issued by WHSQ, Department of Employment and Industrial Relations will be recognised by WorkCover as evidence of meeting requirements for GIT. On 1 July 2008, WorkSafe Victoria commenced the delivery of general induction training under the National Code. Victorian construction induction cards are uniquely numbered and must include date of issue, card registration number, name, date of birth and signature of the cardholder and carry the WorkSafe logo. Red cards were issued in Victoria upon successful completion of the Victorian Foundations for Safety construction industry basic induction course - OHS until 30 June 2008. WorkCover will continue to mutually recognise red cards issued to Victorian residents. Red cards are uniquely numbered and include date of issue or completion, name of the card holder, name of the training provider and may vary in colour and presentation but must contain the Foundations for Safety logo. WorkCover will continue to recognise red cards issued to Victorian residents.